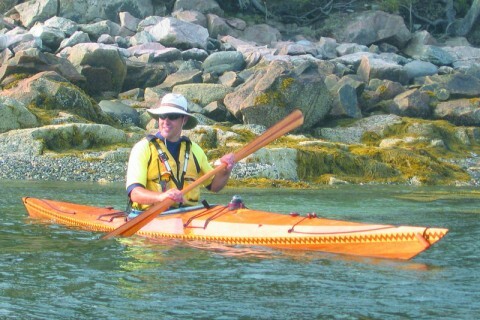 The Bluefin is very fun and comfortable to paddle. It is a multi-panel/multi-chine “stitch and glue) hull, which gives a nicely contoured shape with a smooth, sharp entry, nearly elliptical mid-section and slick stern. It has good Initial stability and a comfortable and predictable secondary stability for leans and Eskimo Rolls. It is fast and responsive and gives a very smooth ride. 17 and 18 feet by 21″ wide. The Bluefin is very fun and comfortable to paddle!!! It has a comfortable cockpit that provides good bracing support: hips, thighs etc. The rear of the cockpit is 9-1/2″ high which is low enough for easy rolling. 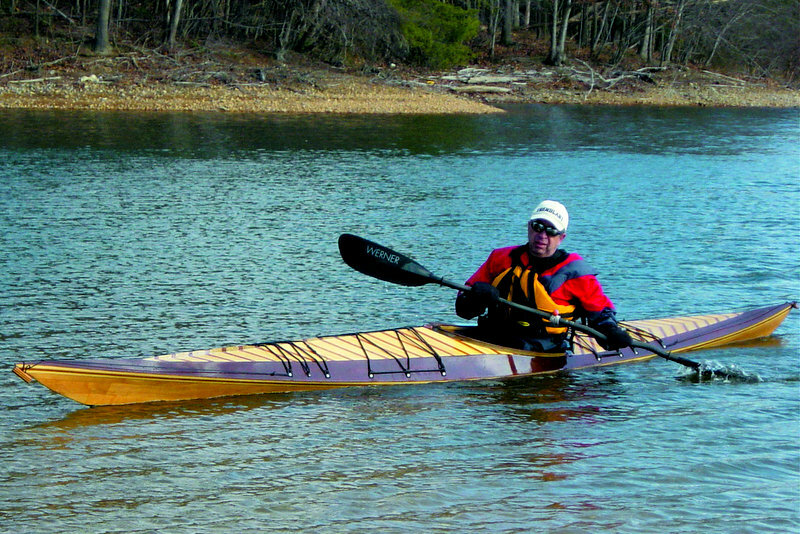 It is a multi-panel/multi-chine hull, which gives a nicely contoured shape with a smooth, sharp entry, nearly elliptical mid-section and slick stern. It has good Initial stability and a comfortable and predictable secondary stability for leans and Eskimo Rolls. It is fast and responsive and gives a very smooth ride. I have a very sharp looking all Sapele (dark mahogany colored) Bluefin here at the house for you to try or purchase. Bluefin plans include full size templates (tape the sheets together and mark your plywood by punching through the paper) and detailed easy to follow instructions. This boat uses stitch and glue construction and can be assembled in about 100 hour of work.